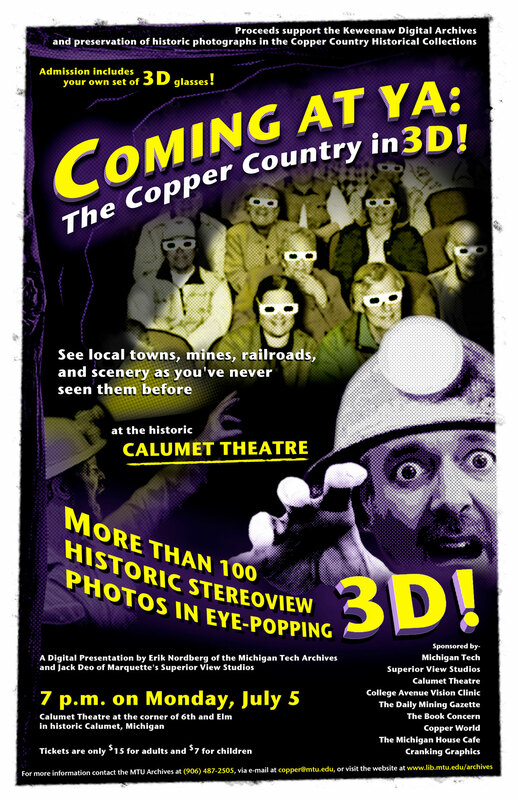 Coming at Ya: The Copper Country in 3D! 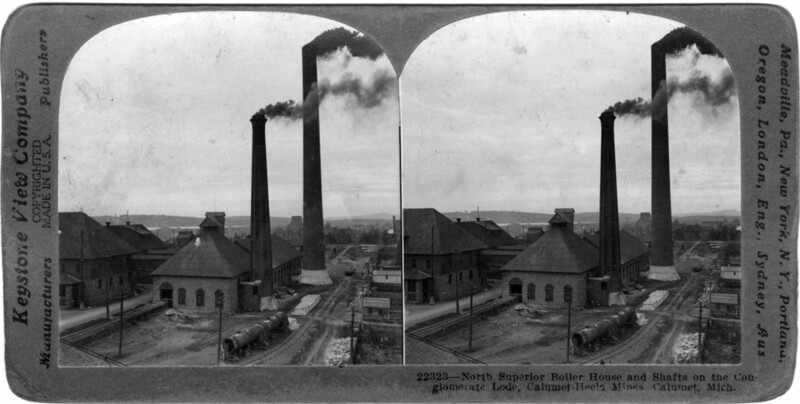 An example of a historic stereoview photograph, depicting the Calumet & Hecla Mining Company. Tired of viewing the Keweenaw’s fascinating history in only two dimensions? Join Erik Nordberg of the Michigan Tech Archives and Jack Deo of Marquette’s Superior View studios as Copper Country people and places ‘back in the day’ jump off the screen with amazing 3D effects! This special event will occur at 7 p.m. on Monday, July 5, at the Calumet Theatre at the corner of 6th and Elm in historic Calumet, Michigan. Using special digital technology, more than 100 historic stereoview photos will be projected on the giant screen of the historic Calumet Theatre where audiences will see them in eye-popping three dimensions using special 3D glasses. See local towns, mines, railroads, and scenery as you’ve never seen them before. This event is a fundraiser for the Michigan Tech Archives, with proceeds supporting the Keweenaw Digital Archives and preservation of historic photographs in the Copper Country Historical Collections. The College Avenue Vision Clinic in Houghton is providing the special 3D glasses for this event. Additional sponsors include Superior View studio, The Daily Mining Gazette, The Book Concern, Copper World, The Michigan House Cafe, and Cranking Graphics. Tickets are only $15 for adults and $7 for children and may be purchased in advance from the Calumet Theatre or at the door. Admission includes your own set of 3D glasses. For further information contact the MTU Archives at 906-487-2505, via e-mail at copper@mtu.edu, or visit them on the web at www.lib.mtu.edu/archives. Many thanks to our sponsors and friends! We managed to sell 271 tickets for the event. A great day for local history!